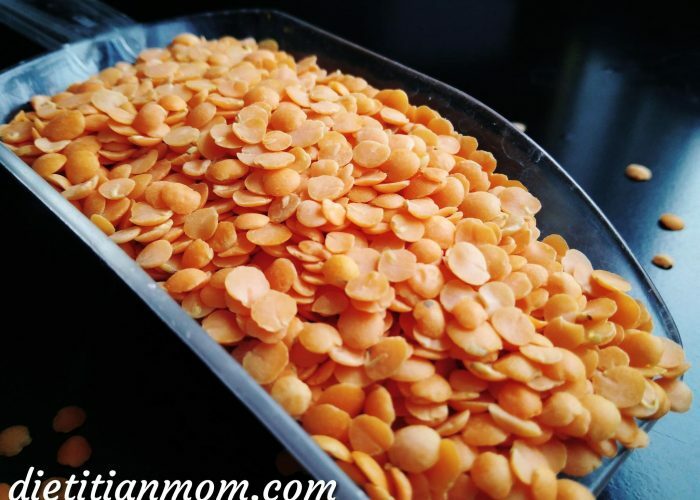 Under the big umbrella family of Legumes (which includes soybeans, peanuts, fresh beans and fresh peas), lentils can be found categorized under the Pulses sub-family. Its siblings in the Pulses family are dry beans, dry peas, chickpeas. Essentially, pulses refer to the dried edible seeds of specific plants in the Legume family. Varieties of lentils grown include yellow lentils, red lentils, green lentils, brown lentils, black (Beluga) lentils and French (du Puy) lentils. Just like the other lentils, red lentils are a great low-fat source of protein and other nutrients. A half cup of raw red lentils provides 22 grams of protein, along with 10 grams of fiber, 3 grams of zinc and 7 grams of iron. Red lentils are also a source of phosphorus, potassium and folate. A straightforward method to prep red lentils to be used for delicious plant-based dishes. Measure a cup of dry uncooked red lentils into a small pot. Rinse the red lentils once or twice in cold water and drain out the excess water. Add 2 cups of cold water to the pot. Place the pot uncovered on the stovetop on a medium heat setting. Once the pot contents start to boil, turn down the fire to a low setting, so that the pot contents continue to simmer gently. Cook 6-8 minutes then taste the lentils to ensure they are cooked through. If so, turn off the heat setting and move to the pot to an unheated burner. You can now use the cooked and drained lentils in your cooking! Reserve the lentil cooking liquid as this makes a great vegetable broth base for other dishes (this keeps in the fridge for a few days). Note that some recipes call for using the uncooked red lentils which will save even more time during your cooking. I usually like to make a bigger batch of red lentils as once (like 2 dry uncooked cups’ worth), as the leftover cooked lentils keep well in the fridge for a few days, and can be used for other dishes. Cooked lentils also freeze well so you can make extra and just freeze a portion in a freezer safe container to take out later and thaw to use in another dish.